Normally, it doesn’t take much for nature to grab my attention. Mother Nature always finds a way to make me do a double take. Such was the case on this February morning where we were treated too much warmer than normal temperatures. So much so that it felt as if we were already halfway through spring. Piedmont Park is located in Midtown Atlanta within a mile northeast of downtown. The 189 acre park is surrounded by large grassy areas, trails to walk, jog and bike and dotted with recreation for man and man’s best friend. At its center is Lake Clara Meer. It was there that I witnessed one of nature’s great oddities. The Muscovy Duck, or cairina moschata, are non-migratory birds native to Central America and parts of southern North America. In their natural form the Muscovy Ducks has mostly black plumage, however, domesticated varieties have been bred to display whiter feathering. The most identifiable feature is the bumpy red face and beak and a series of feathers that gives the impression of a Mohawk down the center of the head. 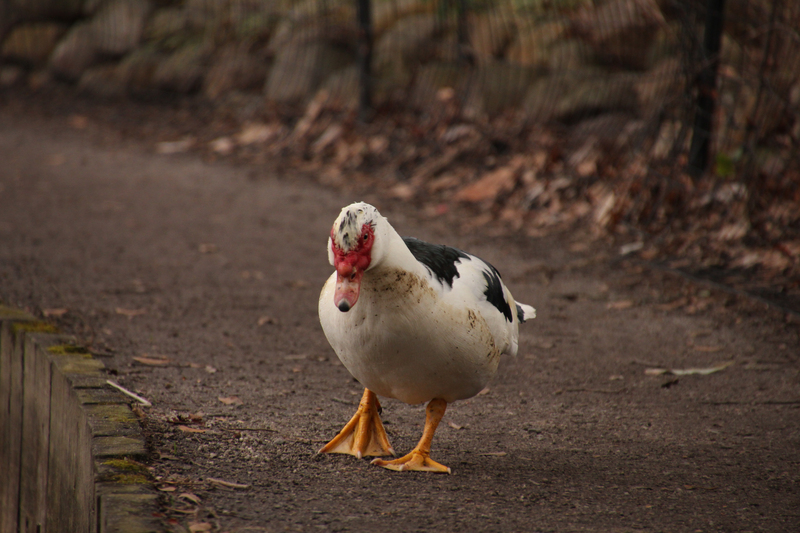 A Muscovy Duck takes a stroll along a path that borders Lake Clara Meer at Piedmont Park in Atlanta. Muscovy Ducks are said to be very intelligent animals according to BirdingInformation.com. They are also known to be shy and silent. However, the commotion these birds made that led me to discover them was anything but shy. I heard a great deal of flapping wings at the surface of the lake. At first, I thought some other wild animal had found its meal. When I walked around to get a better look at what ended up looking like a Muscovy Duck fight to the death. Like with other members of the animal kingdom, males will often fight for dominance and for right to mate with females. 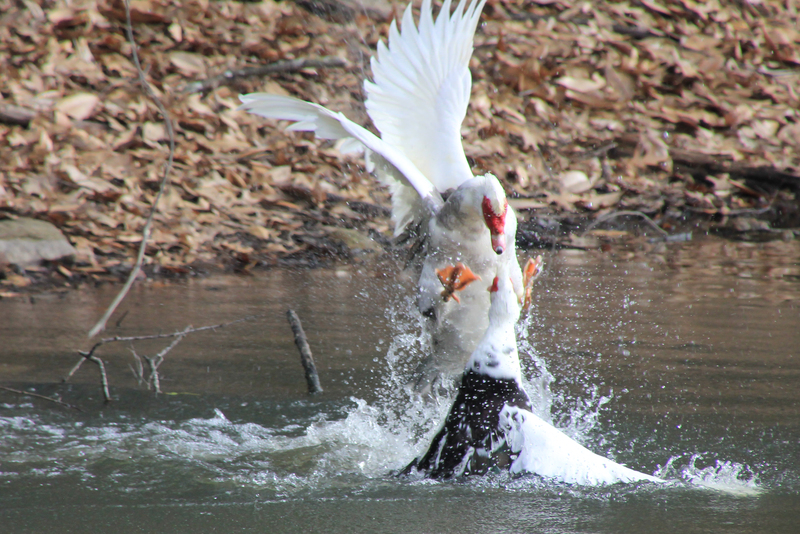 Two Muscovy Ducks fight in the lake at Piedmont Park in Midtown Atlanta. While it is uncommon to see these birds this far north, the immediate environment provided by Piedmont Park mirrors their natural stomping grounds. “They prefer habitats with water and sheltered trees such as rivers, ponds, wooded swamps, and brackish coastal wetlands,” according to BirdingInformation.com. 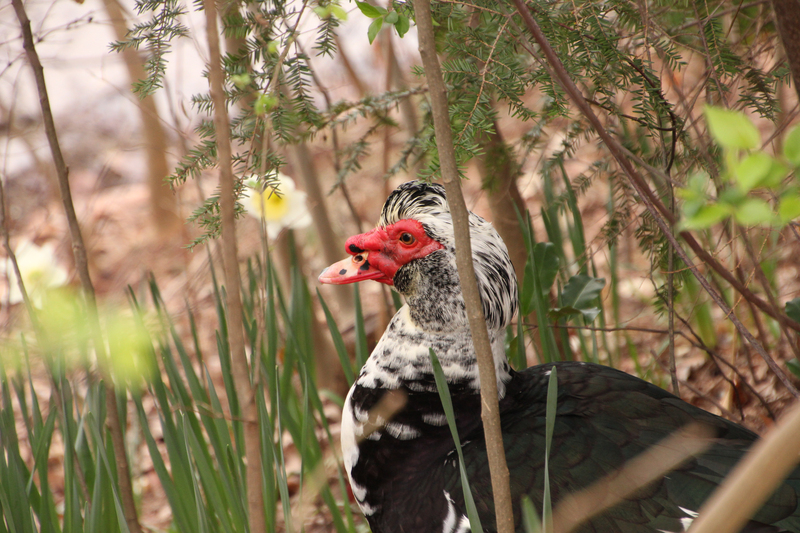 A Muscovy Duck rests in the brush and lilies staring out at the lake at Piedmont Park in Midtown Atlanta. Great article I had no idea these ducks were there great pictures! ← How one t-shirt changed everything.